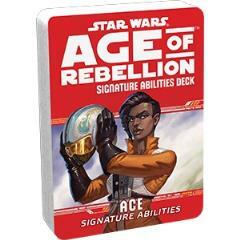 Climb effortlessly through the ranks of the Rebel Alliance with Star Wars: Age of Rebellion Specialization Decks! Created via FFG’s in-house manufacturing, Age of Rebellion Specialization Decks let you keep the text of your character’s abilities at your fingertips. Spend less time consulting your blueprints and more time updating Rebel tech, blowing up Imperial shield generators, and convincing the galaxy’s citizens to join the fight for freedom! The Ace Signature Abilities let your Ace character take out enemy targets more efficiently and keep fighting longer. This One Is Mine allows an Ace to ignore the chaos of battle and focus on an individual enemy targets without distraction. Unmatched Survivability keeps your ship going strong even after it has taken damage that would put another vehicle out of commission. The Ace Signature Abilities Deck enables you to tap into these abilities easily and stay focused on the action.